We’re constantly working to secure our users and their data. Earlier this year, we detailed some of our latest anti-phishing tools and rolled-out developer-focused updates to our app publishing processes, risk assessment systems, and user-facing consent pages. 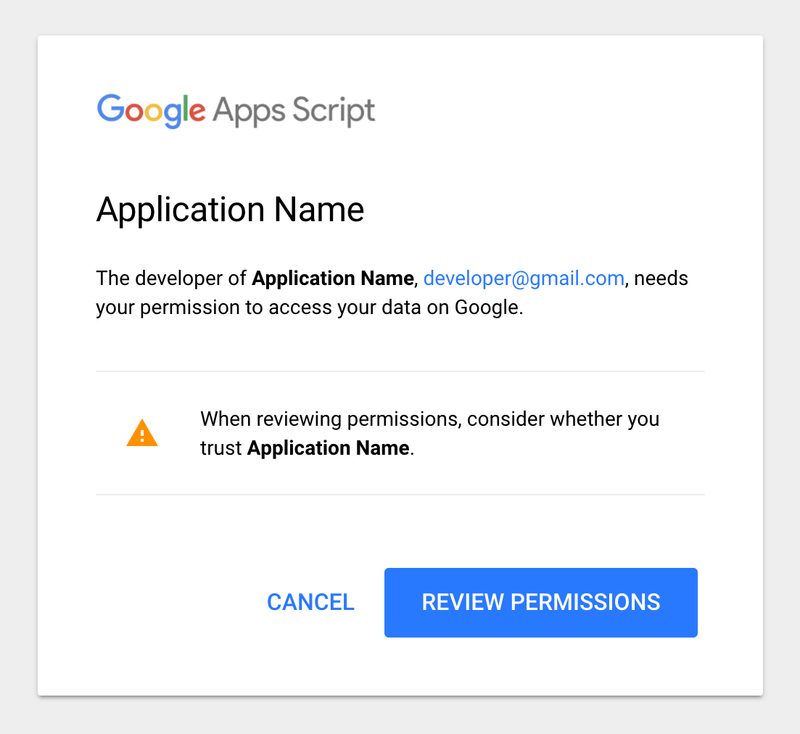 Most recently, we introduced OAuth apps whitelisting in G Suite to enable admins to choose exactly which third-party apps can access user data. Over the past few months, we’ve required that some new web applications go through a verification process prior to launch based upon a dynamic risk assessment. Today, we’re expanding upon that foundation, and introducing additional protections: bolder warnings to inform users about newly created web apps and Apps Scripts that are pending verification. Additionally, the changes we're making will improve the developer experience. In the coming months, we will begin expanding the verification process and the new warnings to existing apps as well. Beginning today, we’re rolling out an “unverified app” screen for newly created web applications and Apps Scripts that require verification. This new screen replaces the “error” page that developers and users of unverified web apps receive today. The “unverified app” screen precedes the permissions consent screen for the app and lets potential users know that the app has yet to be verified. This will help reduce the risk of user data being phished by bad actors. This new notice will also help developers test their apps more easily. Since users can choose to acknowledge the ‘unverified app’ alert, developers can now test their applications without having to go through the OAuth client verification process first (see our earlier post for details). Developers can follow the steps laid out in this help center article to begin the verification process to remove the interstitial and prepare your app for launch. We’re also extending these same protections to Apps Script. Beginning this week, new Apps Scripts requesting OAuth access to data from consumers or from users in other domains may also see the "unverified app" screen. For more information about how these changes affect Apps Script developers and users, see the verification documentation page. Apps Script is proactively protecting users from abusive apps in other ways as well. Users will see new cautionary language reminding them to “consider whether you trust” an application before granting OAuth access, as well as a banner identifying web pages and forms created by other users. In the coming months, we will continue to enhance user protections by extending the verification process beyond newly created apps, to existing apps as well. As a part of this expansion, developers of some current apps may be required to go through the verification flow. To help ensure a smooth transition, we recommend developers verify that their contact information is up-to-date. In the Google Cloud Console, developers should ensure that the appropriate and monitored accounts are granted either the project owner or billing account admin IAM role. For help with granting IAM roles, see this help center article. In the API manager, developers should ensure that their OAuth consent screen configuration is accurate and up-to-date. For help with configuring the consent screen, see this help center article. If you’re a G Suite admin (or a developer creating apps for admins), it’s important to understand the various applications your company’s employees are using and how they’re accessing them. Today, we’re making that easier by introducing app identification (i.e. originating_app_id) in the Google Drive audit logs within the Admin SDK Reports API. Now, your apps will be able to determine whether an activity logged was performed by a user in the Drive Android app, Drive iOS app, Google Chrome, or through a variety of other third-party apps that leverage, modify or create files within Google Drive, like Smartsheet or Asana. This will give you a better sense of the apps being used in your organization, as well as the extent and context of that usage. To learn more about this new feature, take a look at the documentation, then integrate into your code so you and other G Suite admins can gain a better understanding of app usage in your domain(s). We look forward to seeing what you build! 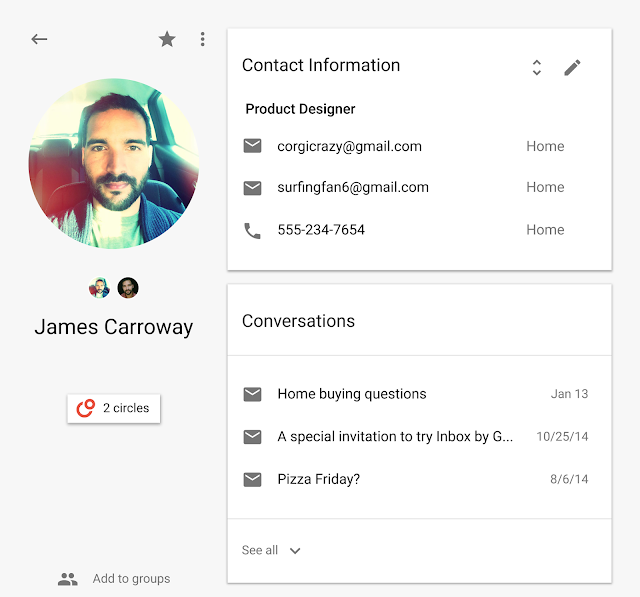 Starting today, the Google People API will get new endpoints for contacts and contact groups. Last year, we launched the Google People API with read-only endpoints with plans to eventually replace the old Contacts API. We’re one step closer to that goal by adding write endpoints that allow developers to create, delete and update a single contact. In addition, there are new contact group endpoints that allow developers to read and write contact groups. Applications need to be authorized to access the API so to get started, you will need to create a project on the Google Developers Console with the People API enabled to get access to the service. All of the steps to do so are here. If you’re new to the Google APIs and/or the Developers Console, check out this video, the first in a series of videos to help you get up-to-speed. Full documentation on the people.update method is available here. 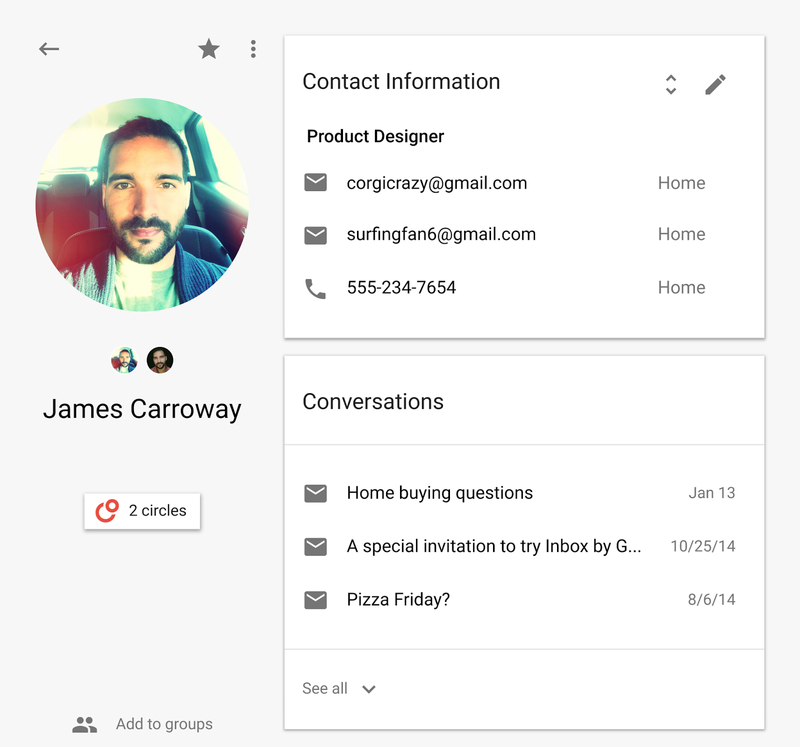 We look forward to seeing what you can do with these new features allowing you to modify contacts. To learn more about the People API, check out the official documentation here.